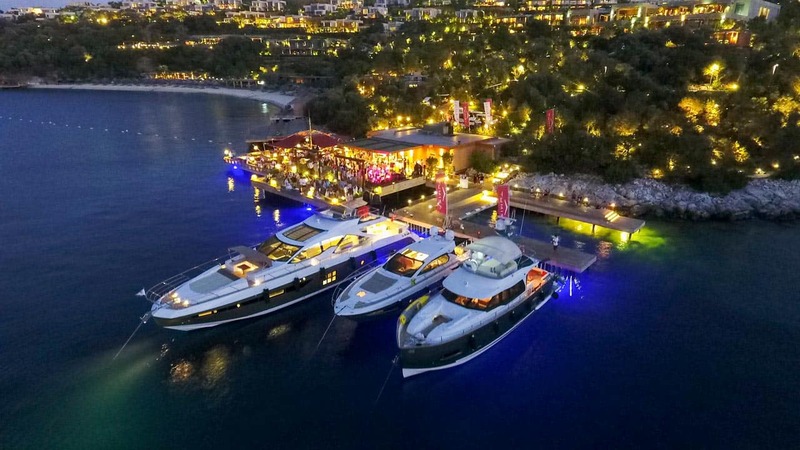 A rich programme of events will enliven the beaches and marinas of Bodrum, Mykonos, Mallorca, Ibiza and Formentera, with all the ingredients for a perfect, unforgettable summer and a single common denominator: a passion for the sea and the latest generation Made in Italy lifestyle – La Dolce Vita 3.0. With a backdrop of crystalline waters and cocktail parties rivalling the spectacle of summer sunsets, the Azimut fleet will ferry its guests around the most beautiful bays in the Mediterranean. The Azimut Summer Wave got underway in Porto Venere with the Azimut Rendez-V Marine, an exclusive event organized by V Marine (official Azimut Yachts dealer), which drew over 200 guests and a fleet of 25 Azimut brand boats to the Ligurian resort. The inauguration of the Azimut Summer Wave featured some unique experiences, including a visit to the Comsubin naval base at Le Grazie (open to the public for the first time) and a gala dinner orchestrated by star chef Carlo Cracco. The harbour front was turned into an exclusive outdoor salon, with exquisite creations by Damiani Gioielli and Venini and tailored suits by Isaia and F.lli Tallia di Delfino ushering guests into an atmosphere of laidback luxury and Made in Italy beauty.